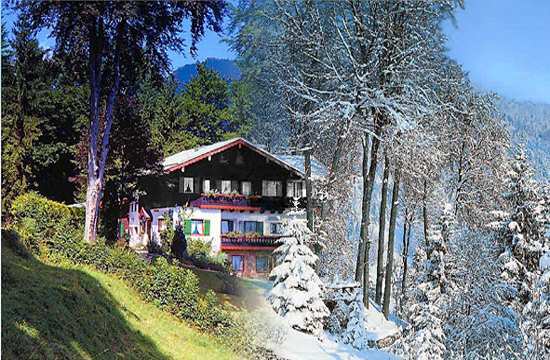 Admittedly, we cannot offer you both winter and summer at the same time – but we CAN offer you everything necessary to make your holiday in Berchtesgaden a comfortable experience. Pure relaxation in stunning nature! Whether you are looking to relax, to be active in wonderful nature, enjoy some well earned comforts or just want to sit and let the world take all your worries away – Country House Kunibert-Hain is an oasis of peace in both winter and summer. Undisturbed peace and quietness in a unique location at the edge of the town of Berchtesgaden. Situated on 3000m2 of parkland it offers a fantastic view and the facilities include children’s play area, laundry room with washing machine and tumble dryer, cable TV in the rooms, internet access and much more. Choose one of five well cared for and completely equipped apartments or our romantic alpine cottage (Kaser), each of which has been furnished with lovely detail. It’s those small details that create the personal and unique atmosphere we offer to our guests. The Online-Wetterfrosch shows you the current weather in Berchtesgaden and in the winter you can also get updates on local skiing conditions. Please contact us by email info@kunibert-hain or by phone +49 8652 2579. During the last Ice Age ice streams formed Lake Königssee. The beauty of this lake and its shores gave the inspiration for the National Park Berchtesgaden which incorporates most of the lake. It drains via the Königsseeache to the river Salzach. Electric boats transport you to St. Bartolomä and Salet. The Watzmann is landmark and myth of Berchtesgaden. Over centuries many stories have paid respect to this peak, the second highest in Germany.